The Advertising and Marketing Services Agency Agreement is an agreement for providing marketing and advertising services to your client. This agreement is usually used by companies or individuals who are providing marketing and advertising services to a client including, but not limited to development of advertising ideas, creation of advertising and marketing material, coordinating with 3rd parties to produce materials and campaign management. This Advertising and Marketing Agency Contract is included in editable Word format that can be customized in Word or by using the included Wizard software. How do you write a Advertising and Marketing Agency Contract document? 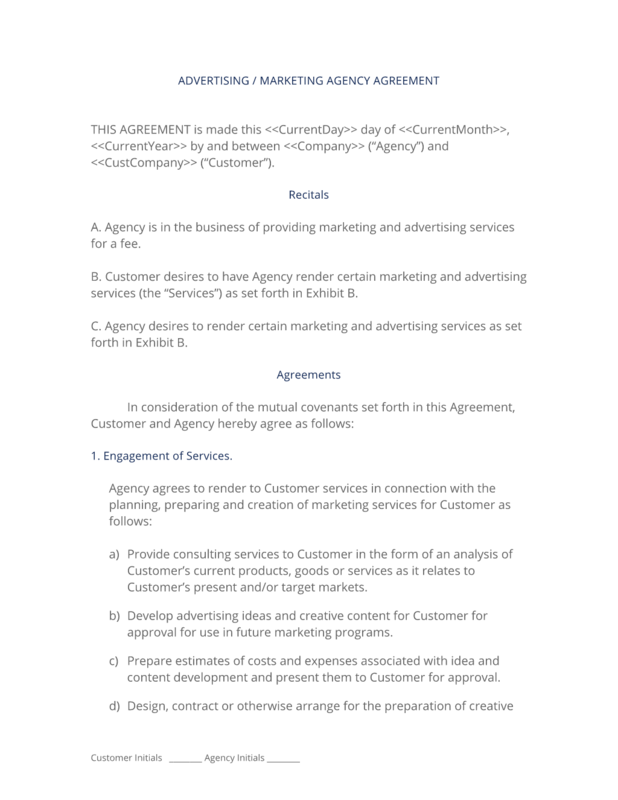 THIS AGREEMENT is made this Current Day day of Current Month, Current Year by and between Company Name ("Agency") and Company Name ("Customer"). Agency is in the business of providing marketing and advertising services for a fee. Customer desires to have Agency render certain marketing and advertising services (the "Services") as set forth in Exhibit B. Agency desires to render certain marketing and advertising services as set forth in Exhibit B. Provide consulting services to Customer in the form of an analysis of Customer's current products, goods or services as it relates to Customer's present and/or target markets. Develop advertising ideas and creative content for Customer for approval for use in future marketing programs. Prepare estimates of costs and expenses associated with idea and content development and present them to Customer for approval. Design, contract or otherwise arrange for the preparation of creative content, advertising, campaign management and other related services. Execute advertising and marketing services as agreed upon in Exhibit B. Provide proofing services on behalf of Customer in order to check for accuracy, completeness, adherence to specifications and Customer branding in all forms of contracted advertising that Agency handles on behalf of Customer. Audit all invoices and expenses provided by third-party to ensure accuracy. Provide other such services as Customer may request from time to time such as content creation, assistance to Customer's staff and employees, market research, analysis or additional project consulting. Agency agrees to develop the advertising and consulting services pursuant to the specifications set forth in Exhibit B attached hereto (the "Specifications"). Agency will use reasonable diligence in the development of the Advertising and Marketing Services and endeavor to deliver to Customer all agreed upon specifications (or "Milestones") outlined in Exhibit B no later than Delivery Date. Customer acknowledges, however, that this delivery deadline, and the other payment milestones listed in Exhibit A, are estimates, and are not required delivery dates. Agency will be retaining all creative source code, original works, files, digital media and other intellectual property for the entire project and providing Customer with the output formats only. Customer shall retain all of its intellectual property rights in any logos, graphics, text, images or other components it owns and transmits to Agency for use in fulfillment or creation of services. Agency shall endeavor to insure that Customer shall be able to retain, under the fullest extent under the law, any and all intellectual property rights in any text, images or other components created for Customer pursuant to this agreement. Customer agrees that any material, content, plan or idea prepared by Agency or submitted to Customer for approval at any stage which is not utilized at the termination of this agreement, shall remain the property of Agency. Customer agrees to return to Agency any materials it may have of Agency such as artwork, mock-ups, comps, text, digital media, film, photos or any other physical embodiment of Agency's creative work performed while under this agreement. Upon termination or expiration of Agreement, Customer agrees to be solely responsible for any additional use of materials and advertisements, created by Agency, pursuant to this agreement. Additional expenses may include, but are not limited to: Fees, Licenses, Translations, Royalties, Talent and other associated fees. Agency's obligation shall not apply with any respect to foreign use. For all of Agency's services under this Agreement, Customer shall compensate Agency, in cash, pursuant to the terms of Exhibit A attached hereto. In the event Customer fails to make any of the payments referenced in Exhibit A by the deadline set forth in Exhibit A, Agency have the right, but are not obligated, to pursue any or all of the following remedies: (1) terminate the Agreement, (2) withhold all materials, services and creative content administered by Agency on behalf of Customer, (3) bring legal action. Customer and Agency acknowledge and agree that the Specifications and all other documents and information related to the engagement of marketing or advertisement development (the "Confidential Information") will constitute valuable trade secrets of Agency. Customer shall keep the Confidential Information in confidence and shall not, at any time during or after the term of this Agreement, without Agency's prior written consent, disclose or otherwise make available to anyone, either directly or indirectly, all or any part of the Confidential Information. Excluded from the "Confidential Information" definition is anything that can be seen by the public in any advertising medium or channel prior to the engagement of Agency to provide services, or information which was provided to Agency by Customer for publication as a requirement of fulfillment of the Specifications. Limited Warranty and Limitation on Damages. Customer agrees to indemnify and hold Agency harmless with respect to any claims, loss, lawsuit, liability or judgment suffered by Customer which results from the use of any material prepared or execution of service by Agency or at the direction of Agency which has been materially changed from the Specifications by any advertisers, publishers, hosts, radio and television broadcasts, quotes, testimonials, print journalism or other third-party entity. Agency agrees to obtain and/or maintain in force for the length of this agreement, at Agency's expense, an appropriate liability policy or policies, having a minimum limit of Insurance Coverage, naming Customer as an additional insured and loss payee under such policy or policies as applicable. In the event of any litigation, proceeding or suit against Customer by any regulatory agency or in the event of a court action challenging any advertising or marketing service prepared by Agency, Agency shall assist in the preparation of defense of such action and cooperate with Advertiser. Customer acknowledges that Agency are not responsible for the results obtained by Customer from any creative, advertising, programs, ideas or execution thereof. Customer waives any claim for damages, direct or indirect, and agrees that its sole and exclusive remedy for damages (either in contract or tort) is the return of the consideration paid to Agency as set forth in Exhibit A attached hereto. Agency will be retained as independent contractors. Agency will be fully responsible for payment of their own income taxes on all compensation earned under this Agreement. Customer will not withhold or pay any income tax, social security tax, or any other payroll taxes on Agency's behalf. Agency understands that they will not be entitled to any fringe benefits that Customer provides for its employees generally or to any statutory employment benefits, including without limitation worker's compensation or unemployment insurance. Customer agrees to make available to Agency, for Agency's use in performing the services required by this Agreement, all logos, graphics, photos, branding, collateral, items of hardware and software as Customer and Agency may agree are reasonably necessary for such purpose. This Agreement shall be binding upon and inure to the benefit of Customer and Agency and their respective successors and assigns, provided that Agency may not assign any of his obligations under this Agreement without Customer's prior written consent. In the event Customer fails to make any of the payments set forth on Exhibit A within the time prescribed in Exhibit A, Agency has the right to withhold further content, creative and services perform for or on behalf of Customer until payment in full is paid, plus accrued late charges of 1 1/2% per month. Customer warrants that everything it gives Agency to use in fulfillment of services is legally owned or licensed to Customer. Customer agrees to indemnify and hold Agency harmless from any and all claims brought by any third party relating to any aspect of the services, creative or other content, including, but without limitation, any and all demands, liabilities, losses, costs and claims including attorney's fees arising out of injury caused by Customer's products/services, material supplied by Customer, copyright infringement, and defective products sold via the advertising or services. Further, customer agrees to indemnify Agency from responsibility for problems/disruptions caused by third party services and contractors that Customer may use such as media buyers, transportation, merchant accounts, shopping carts, shipping, hosting services, real time credit card processing and other services that relate to the execution of the services outline in this agreement by Agency. Customer grants Agency the right to use the creative content, description of services performed, results of services and campaign data as it sees fit for promotional purposes. Agency has no responsibility for any third party taking all or any part of the content, ideas, or services provided to Customer by Agency. This agreement shall begin on Start Date and shall continue in full force until terminated by either party upon at least (30) days prior written notice. The complete Advertising and Marketing Agency Contract - with the actual formatting and layout - is available in this Contract Pack.